We had not been having a great experience in Dublin so far. 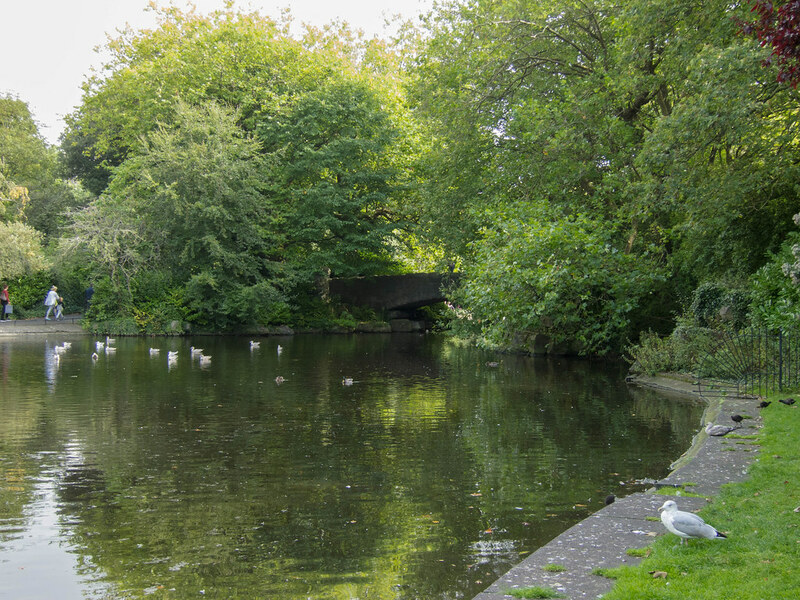 And then we came upon St. Stephen’s Green. It changed everything. 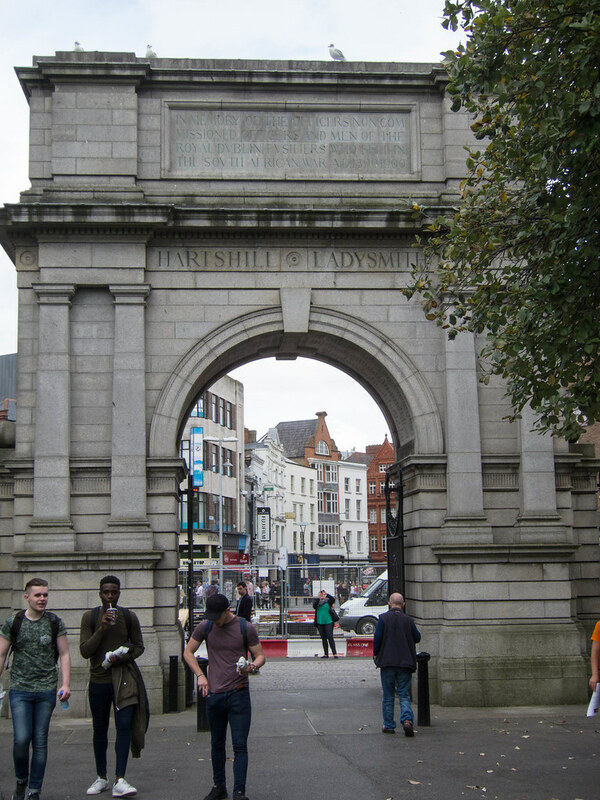 Expensive tourist-trappy attractions, criminally slow restaurant service, large crowds and lots of noise everywhere — Dublin had been everything the rest of Ireland had not been. After a disappointing experience trying to see the Book of Kells, we knew we needed a break, a quiet place to walk and talk and hold hands. We were still on our honeymoon, after all! Google Maps told us this park was just a few blocks away, so we walked over. What a quiet respite it was! Like everyplace else in Dublin, it was loaded with people. But unlike everyplace else in Dublin, it was clear we were all there for a little peace. 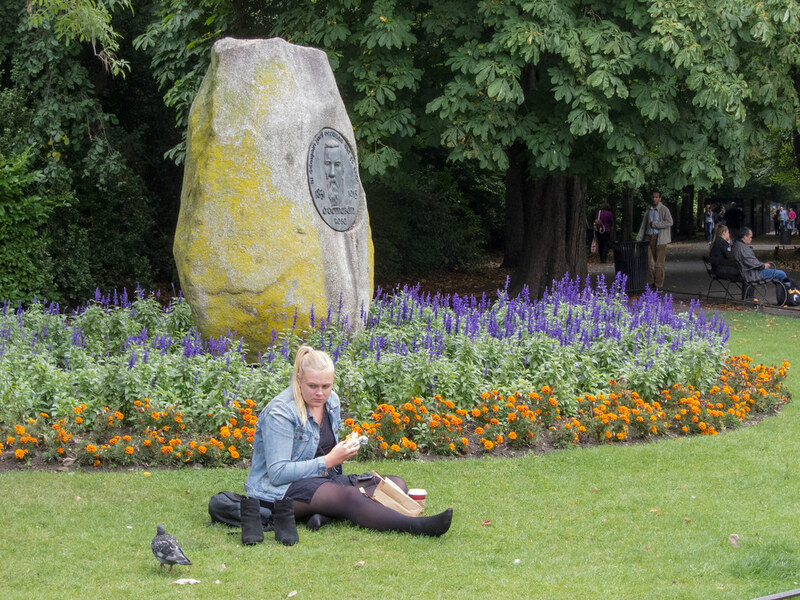 We found quiet, even a little solitude, in St Stephen’s Green. 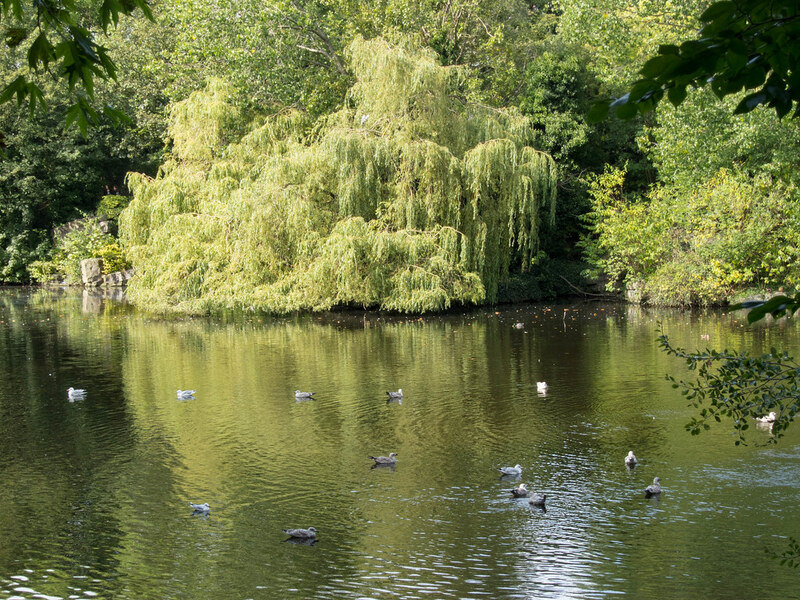 This 22-acre park has existed in some form since around 1664, but was private until the Guinness family led an initiative to convert it for public use. 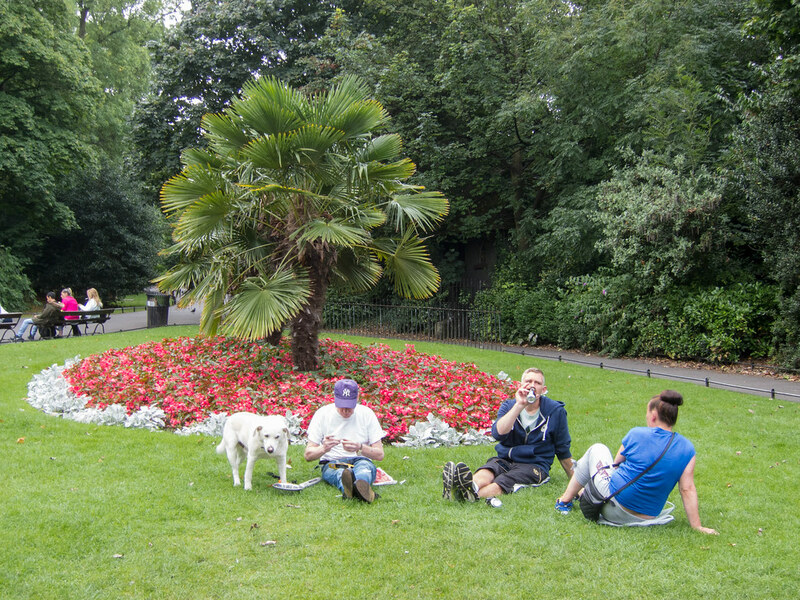 Sir Arthur Guinness paid to have the park redesigned to its current layout, which opened in 1880. As Margaret and I strolled through, the tree-rimmed area around the pond seemed the most remote. We forgot for a moment that this was in the heart of Dublin. All we could hear was the rustling breeze and the chirping of birds. 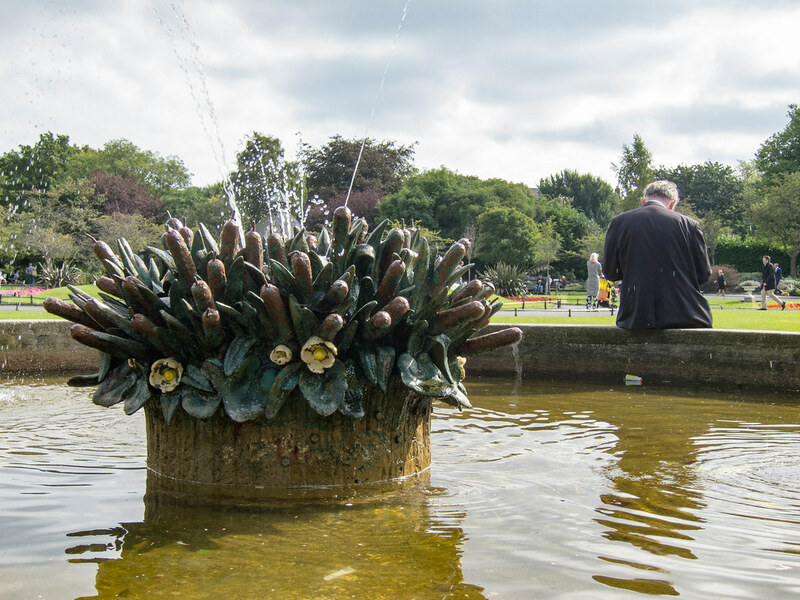 I think this part of the park did more to restore our spirits than any other. 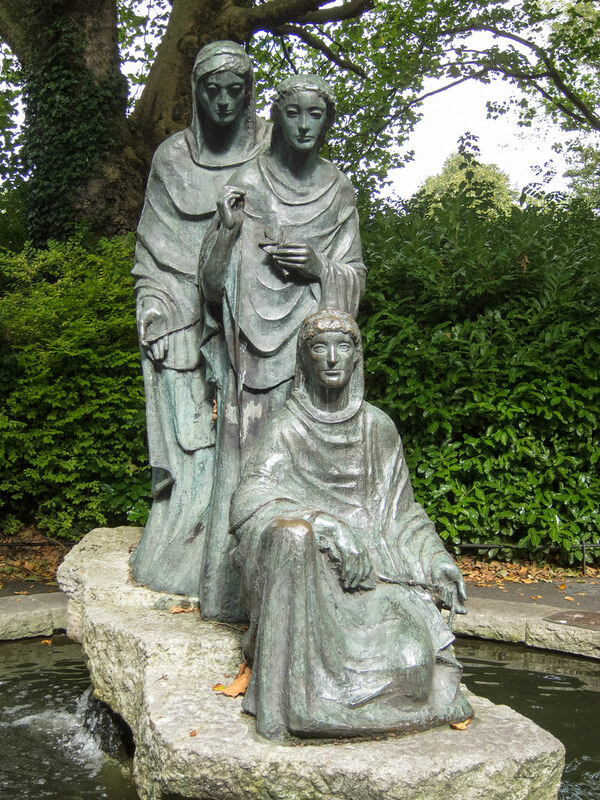 Upon reading the little plaque describing this statue of the Three Fates, I was deeply moved. In German, Gaelic, and English, it expresses gratitude to the Irish people for help they gave to German children after World War II. The Irish provided foster homes for hundreds of German children whose families had died and whose homes had been destroyed during the war. While most of the children later returned to Germany, some remained, and were even adopted by their Irish families. 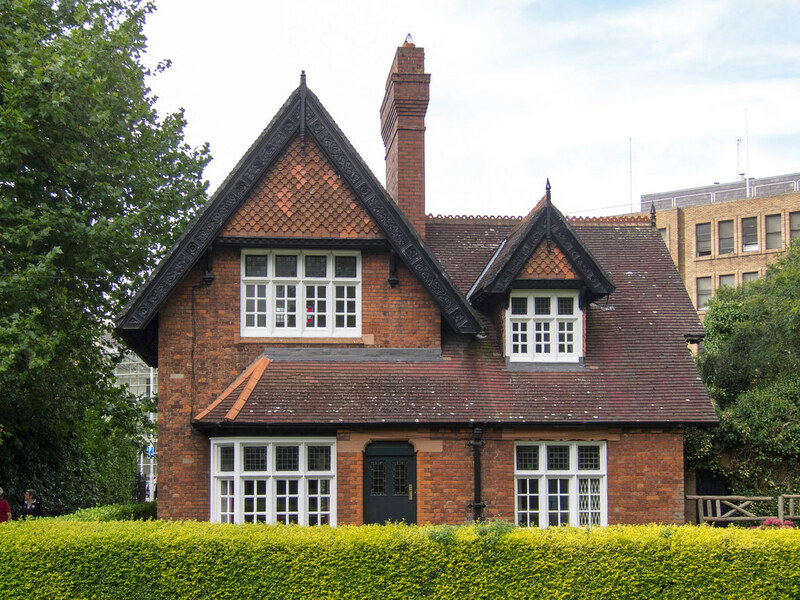 When we came upon this cute little house in the park’s southwest corner, Margaret declared, “There it is, our dream house!” Except that our morning commute to our jobs in Indiana would be challenging. Apparently at one time the park’s caretaker lived here. We lingered for a couple hours, walking and talking and taking photographs. Soon our stomachs grew insistent that we seek sustenance, and so reluctantly we left. 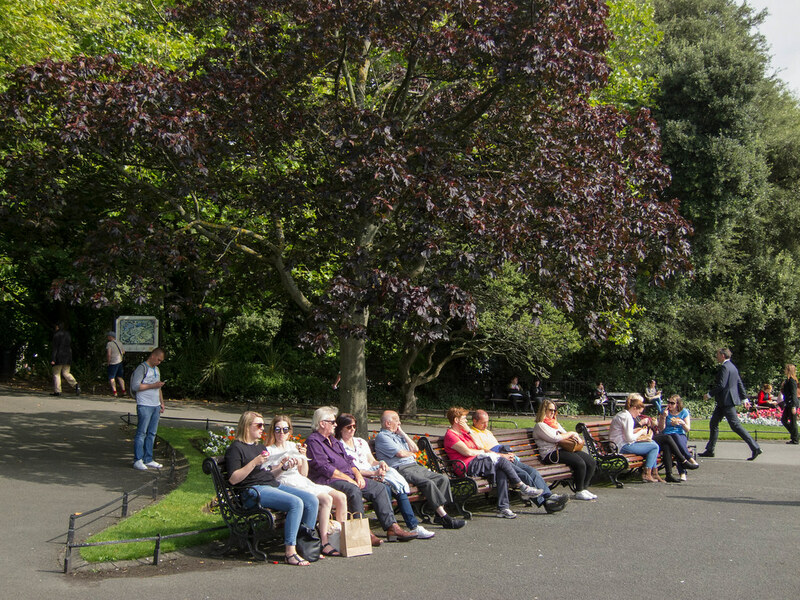 But St. Stephen’s Green was a turning point of our time in Dublin. Reset and refreshed, we enjoyed our experience from here on out. Until this moment, I had no idea that there had been a large scale taking in of German children after the war by the Irish. I’ll bet there was some culture shock to all concerned. But what a great thing. I didn’t know about it either! I also didn’t know Ireland was neutral during WW II. I’m sure their UK neighbors didn’t appreciate that. That woman on the grass sure is giving the evil eye to that pigeon! She was! I was glad I acted fast enough to capture that. I was discussing Ireland with my Mom, who visited about a decade ago. Her experience in Dublin was not quite as negative as yours, but definitely agreed that the rest of the country was more interesting and enjoyable. She also recognized the pedestrian bridge you featured a few weeks ago. It is apparently called the Ha’penny bridge and was 200 years old last spring. That name for the bridge rings a bell. We just got off to a rough start in Dublin. But it got better! Love the three fates statue. Makes my heart happy to see. Can’t wait to go to Ireland myself. I admit, I shed a tear at the Fates statue, once I learned of its history. OH how I dream of vistiting Ireland with my camera!! Ireland wasn’t on my travel bucket list, but it was on my wife’s. So we went! It’s a great place to vacation.